Try it! Pick out one thing; an article of clothing, a dish on your dinner table, and mentally trace as much as you can of the web of life that brought that particular thing to you. This is one of my favorite exercises in gratitude; we might think of ourselves as quite self-sufficient, but if we give it a little thought, we will realize what an amazing network of connections surrounds us to nourish and protect us, and each and every thread of that web eventually traces all the way back to God. 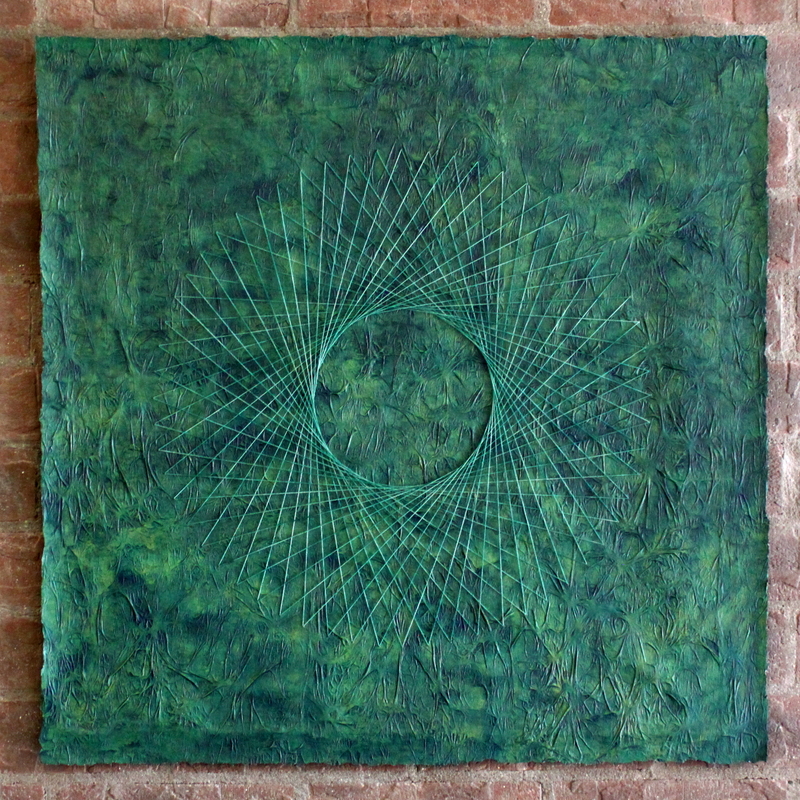 This piece is made almost entirely with recycled or reclaimed materials. The texture of the background was made with Risograph duplicator master material, which is basically a layer of very very thin plastic bonded to a layer of very very thin tissue paper. This was carefully heated on the plastic side until it began to melt and distort, creating the interesting cellular texture you see in this piece. The surface was then glued to a backing and sealed with a matte acrylic sealer, so it could be painted with several layers of hand-mixed leftover house-paint. The backing material is asphalt-impregnated roofing paper, which is thick and durable, but also flexible. It is mounted to a framework of made of reclaimed plywood, to stabilize it so the pattern could be stitched onto it without buckling the background. The stitching was done with leftover cotton weaving yarn, dyed with leftover t-shirt dye to a variegated green. 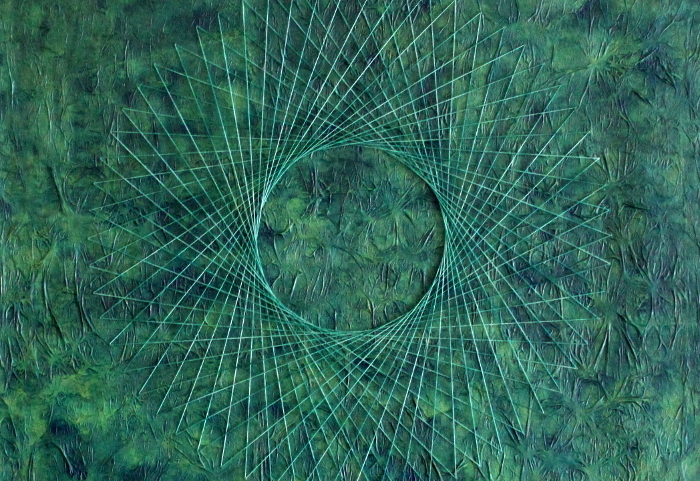 The Web of Life ~ melted duplicator master, house paint, hand-dyed cotton string, on asphalt roofing paper ~ 37″ x 37″ ~ Ordinary Time 2016. Once again another neat piece! Also a nice write up. It was very thought provoking! I agree that everything traces back to God. Also it is not as some say that every thing’s origin traces back to the muck and more that we supposedly crawled out of… ugh! “…you shall eat bread, until you return to the ground, for out of it you were taken; you are dust, and to dust you shall return.” (Genesis 3:19) It is wise to remember that we are, miraculously, BOTH; of God, and of Earth. If we think only one or the other, we can get caught up in either pride or despair.